Working with a variety of state and local partners, the sanctuary has established the Great Lakes Maritime Heritage Trail. 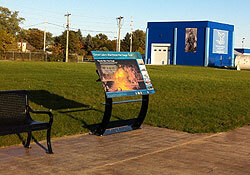 The trail promotes and interprets Northeast Michigan’s rich maritime heritage. By providing innovative interpretation that enhances individuals’ experiences while accessing maritime resources, the trail fosters an appreciation for the Great Lakes and their rich history. The sanctuary has established segments of the trail along the Thunder Bay River, which features a boardwalk and a pedestrian bridge, historically-themed riverfront park, historic docks, and outdoor interpretive signage. Long-range plans are being developed to expand the Great Lakes Maritime Heritage Trail along Northeast Michigan’s Lake Huron shoreline.